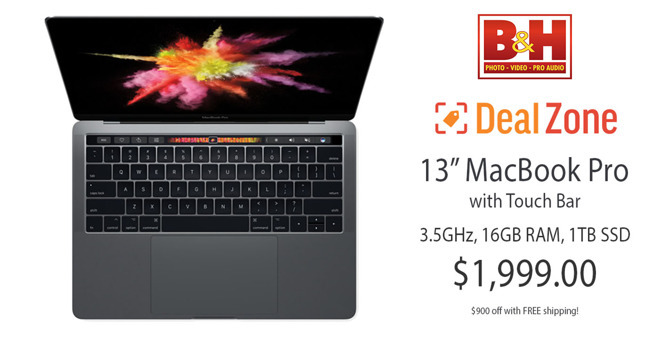 B&H is kicking off the week with a record-breaking discount that delivers the lowest price available on Apple's top-of-the-line Mid 2017 13-inch MacBook Pro with Touch Bar. Pick up the 3.5GHz model with 16GB of RAM and 1TB of storage for just $1,999, a discount of $900 off. What's more, B&H will not collect sales tax on orders shipped outside many states, including California, and the systems qualify for free shipping within the contiguous U.S. Both Space Gray and Silver are eligible for the flash discount, which ends at 11:59 p.m. Eastern on March 11 (or while supplies last). To put the deal in perspective, this offer rings in as the lowest price available for the loaded configuration, according to our 2017 13-inch MacBook Pro with Touch Bar Price Guide. And to get that much RAM and storage in a 2018 model, one would have to spend at least $550 more. For even more deals on Apple products, be sure to check out our Apple Price Guide, which is updated throughout the day.